CLEVELAND (AP) Once the lead swelled to 14, Kevin Durant waved both arms like a boxing referee stopping a fight. Another knockout on the road for these Warriors. 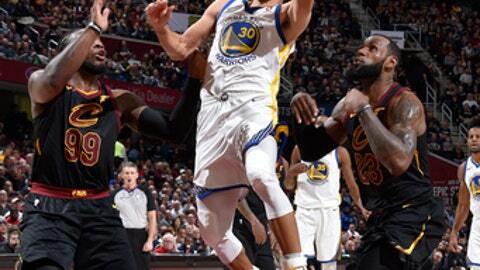 Durant scored 32 points, Stephen Curry added 23 and Golden State extended its road winning streak to 13 with a 118-108 Martin Luther King holiday victory Monday night over the Cleveland Cavaliers, their struggling NBA Finals foes. Durant scored 16 in the third quarter for the defending champions, who clamped down on defense and pulled away in the fourth to remain unbeaten outside Oracle Arena since Nov. 22. It’s not that they play poorly at home, but Durant said the Dubs take a different identity when they travel. LeBron James scored 32 points and Kevin Love 17 for Cleveland, which had its home winning streak stopped at 13. Isaiah Thomas, getting his first taste of the Warriors-Cavaliers rivalry, had 19 points in 32 minutes – his most in five games as he returns from a hip injury. It was Golden State’s second straight win over Cleveland, which has dropped eight of 10 dating to a loss to the Warriors on Christmas Day. The Cavs were down just 93-91 entering the fourth, but missed 17 of 19 shots to open the period, and Golden State throttled away. The teams have met in the Finals each of the past three years. And while there’s no guarantee there will be a fourth matchup, at this point only one of them looks prepared in January for June. Durant, though, expects the Cavs to improve as they incorporate Thomas. Cleveland was home after going 1-4 on a road trip that included blowout losses in Minnesota and Toronto. For three quarters, the Cavs matched the Warriors shot for shot. But with Durant and Curry on the bench, a Golden State lineup of Andre Iguodala, Draymond Green, David West, Klay Thompson and Shaun Livingston stretched the lead. Despite their recent struggles, the Cavs remain a confident bunch, and they showed some early swagger. After he and his teammates were introduced to ”Gloves Are Comin’ Off” by rapper 7kingZ, James came out swinging. He was in attack mode from the start, scoring 16 points in the first quarter and setting the tone for the Cavs. Later in the half, James retreated down the lane for a huge block on Durant, blasting the ball off the glass to trigger memories for Cleveland fans of his famous chase down on Iguodala in the closing minutes of Game 7 of the 2016 Finals. Curry threw down a two-handed dunk in the third quarter that surprised his teammates. Thomas came away from his most extensive court time feeling good. Warriors: Continue five-game trip on Wednesday in Chicago. Cavaliers: Host Orlando on Thursday. The Magic beat the Cavs earlier this season in Cleveland.